Gwen Shamblin, New York Times best-selling author of The Weigh Down Diet releases the highly anticipated 400-page hardback book History of the Love of God, Volume II: A Love More Ancient Than Time that will change your perspective on life and your purpose forever and will affect how you parent, who you are in the workplace, and how you treat your spouse and loved ones. During the book’s pre-release, a select group was asked to help review the book. So many personal testimonies from this group began to pour into Gwen’s personal phone and the office about how their lives were forever changed that a webpage was set up to chronicle these testimonies (http://gwenshamblinbooks.com/history-of-the-love-of-god/). Imagine walking through difficult relationship situations, reviving marriages that seem over, work challenges, losing the desire to overeat, drink or medicate, and solving seemingly insurmountable parenting issues with God’s perspective…with love. Through this book, you will feel and realize a love for God which is so deep it changes the very motive of your heart. From the Bible, we know that God commands us to love Him first, then love our neighbor as ourselves...but what does this really mean, and how do we apply it in our lives? 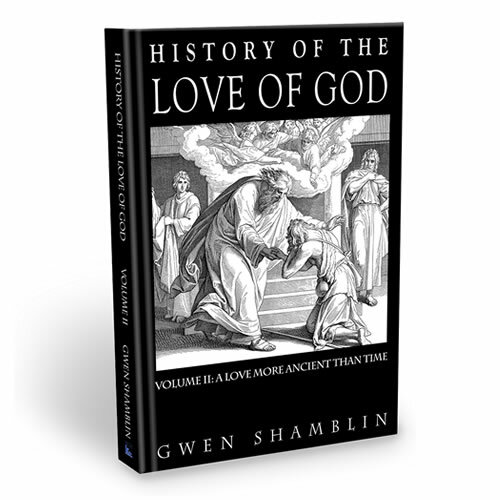 Penned from Gwen's own experience and decades of teaching seekers how to have a relationship with the Father, this book is a beautiful and inspiring writing that starts with a history of God's love for man and mankind's appropriate love back to the Father, then explains how this True Love can overflow into love for those around you (even the unlovable)! A Love More Ancient Than Time will move your heart to a deeper true love for God, a greater appreciation for Christ and more compassion for your fellow man! A Special Note: The cost is free for the soul, but to defer cost and to provide a way to produce future volumes and to disseminate this information to others in the future who cannot afford, the suggested pricing for this life-changing information is $19.99. If you are in need of a full or partial scholarship, please contact our office at 1-800-844-5208 and we will assist you. If these materials have changed your life, please pray concerning an additional donation. Please note that considering our suggested pricing and the ability to edit that amount as you need, this is a final sale item.